This super easy vegan carrot cake is made with cinnamon applesauce to keep it nice and moist, which means that you don't need an egg-replacer or an egg substitute at all. While this does keep it simple and makes it virtually foolproof (and a great vegan cake recipe for new vegans or anyone new to baking to try), it also means that this carrot cake isn't super light and fluffy. But that's ok - it's carrot cake, after all, and not angel food cake (which is supposed to be light and fluffy!). Pre-heat your oven to 325 F. Grease and lightly flour a 9-inch square baking pan (you can also use sugar in place of the flour, or a combination of the two if you'd like). In a large bowl or using a mixer, combine the applesauce, vanilla, vegan margarine, salt, baking powder, cinnamon, sugar, flour and soy milk until well mixed. Add the carrots and walnuts, gently folding them in to combine well. I personally prefer a carrot cake without walnuts, so I leave them out (and sprinkle them on top of the frosting, rather than in the cake), but I find that most other people actually prefer the walnuts. They're optional - up to you. Spread your carrot cake batter evenly in your prepared baking pan. Bake in the pre-heated oven for 45 minutes. Allow your carrot cake to cool completely. 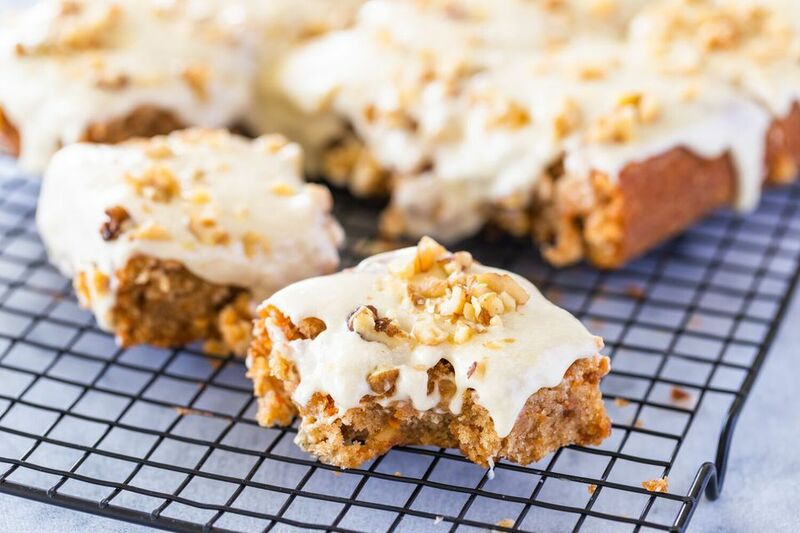 Frost your vegan carrot cake with a vegan cream cheese frosting. Frost your homemade vegan carrot cake with a traditional vegan cream cheese frosting. Or, you might also want to try this recipe for a vegan lemon frosting which would also go nicely with this carrot cake.